In a world adrift with ocean plastic and choking on pollutants, green burials are gaining popularity as people want to literally get back to the land. The once-hippy aesthetic of natural living has gone reasonably mainstream, but will natural after-living catch on, too? Judging by the growing popularity of green burials, it quite likely will. Much like we now call “organic farming” what our ancestors simply called “farming,” the vast majority of all burials were once green burials. Families prepared and dressed their deceased relative, the local carpenter would make a pine casket, the local community would pay its respects over the course of a few days, and before too long, the body would be buried in a cemetery, or possibly right in the yard if the family owned property. The Civil War ushered in the need to preserve the corpses of battlefield dead in order to return them to their families for burial. When Abraham Lincoln was assassinated in 1865, he was embalmed to preserve the body in a lifelike state for the funeral train that took him from Washington home to Springfield, Illinois. From then on, the modern funeral became an industry of its own. The ecological impact of standard funerals is steep, and the population explosion that accompanied industrial culture means more bodies and more pollutants. Even our best efforts at preservation are doomed to fail eventually, which results in several gallons of carcinogenic embalming fluid seeping into the water table for each person buried in the usual manner, not to mention the tons of steel, board feet of (sometimes tropical) lumber, and all that concrete for the vaults across the land. Cremation isn’t much better, spewing dioxin, hydrochloric acid, sulfur dioxide, and carbon dioxide into the air during incineration. Our own deaths shouldn’t be the cause of death for others, no matter how slow. The gateway concept for the popular resurgence of green burials may have been the Bios Urn. This product is a biodegradable urn that holds a supply of cremains, plus a small capsule of soil and a single tree seed. It looks a lot like a tall paper cup of take-out coffee and is available for $140 from their website. The concept is superficially appealing, but $140 can also buy a small orchard’s worth of young trees that may be planted over cremains when you don’t need a flimsy brand-name urn to temporarily hold them, and it doesn’t eliminate the need for cremation in the first place. Still, the idea of nurturing trees after we die has a certain timeless charm to it, especially for people who embraced ecological practices while alive. Surely there must be a better way to rejoin the circle of life when our time comes? An old Jewish cemetery. Traditional Jewish funerary practices, which are meant to allow the body to decompose naturally, may end up being green burials by default. Public domain photo by Katrina_S, courtesy of Pixabay.com. Happily, there is! 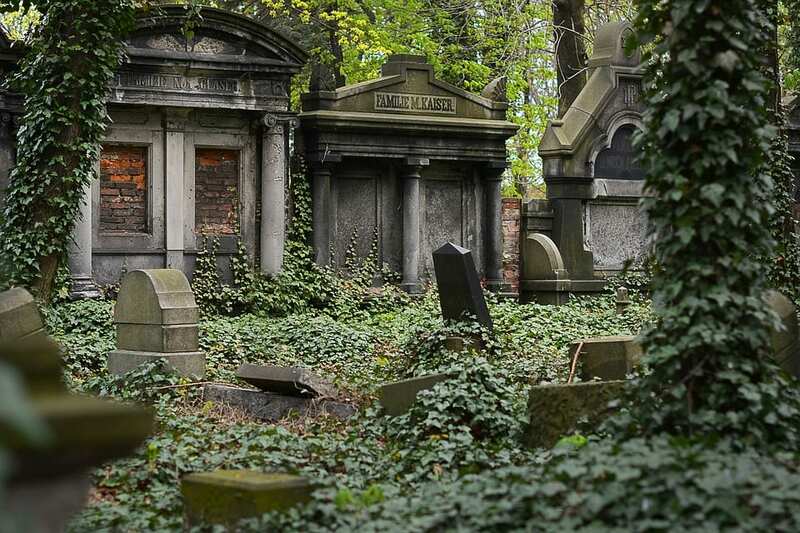 Low-impact green burials are coming back into fashion. Varnished wood and brass caskets are giving way to simpler pine or even wicker boxes and recycled paper-based ecopods in some cemeteries. Instead of rows of fancy headstones, there are more options for trees or wildflowers to be planted nearby, with GPS coordinates provided to remember the location. Several jurisdictions are starting to reconsider laws in ways that make green burials possible. In 2017, the Vermont state legislature passed a law changing the minimum burial depth from five feet to three and a half feet, a depth that makes natural decomposition occur faster due to increased biological activity in the soil. In Tennessee, the Larkspur Conservation easement also serves as a natural cemetery, where people can be buried without caskets at all. Washington State will soon consider a bill that would legalize composting the dead, with the resulting soil amendment taken home by the family of the deceased. Canada’s first green cemetery, on Denman Island, is meant to regenerate a forest. And for those who would prefer to become part of a tropical reef, the Neptune Society in Florida plans to cover 16 acres of the ocean floor off of Key Biscayne with cremain-infused concrete. Green burials aren’t the perfect solution for pollution problems, since people still contain lots of nasty bits, from artificial hips and breast implants, to pathogens like cholera and salmonella. However, low-impact natural burials can end up costing a lot less than the other kind, and are deeply satisfying for people looking to reconnect to the natural cycle in ways that our mechanized, plastic lifestyle usually can’t. What kind of tree do you want to be when you grow up?